The Bible is God’s Word. In it we learn so much about Him and His plan for the whole world. The Bible is split into 2 parts: The Old Testament and the New Testament. In the Old Testament, we learn that, from the beginning of time (creation), God was there. He made mankind and, even though they broke His commandments and deserved to die, He still loved them and desired to provide a substitution. Sacrificing a lamb was the only way this substitution would work. God tells us that the punishment for sin is death (Romans 6:23). It was not until the New Testament that God revealed Himself in a human body. He called Himself Jesus. We celebrate this event at Christmas! When the right time had come, God sent His only Son, Jesus, to pay the ultimate price for our sins (Gal 4:4). Jesus would grow up, just like all of us. He would go to school and learn to work with His dad, Joseph. However, Jesus came for so much more! He knew that He needed to do what God, His Father, sent Him here to do. When He was 12, He said to His parents, “Didn’t you know that I must be about my Father’s business?” Jesus was not talking about Joseph’s business, but God’s business (Luke 2:49)! Before He began doing God’s work, He called twelve men to be His helpers. The Bible calls them His disciples. A disciple is a student or a follower [of Jesus]. Jesus did many miracles to prove to people that He was not only the Son of God but that He also was God. A miracle is something that only God can do. These miracles attracted a lot of attention. One miracle that Jesus did was feed 5,000 people with just five loaves of bread and two fish! Jesus also raised people from the dead! Many people believed on Him after hearing Him teach and seeing the miracles. Even the king wanted to see Jesus do something amazing. Even though many people believed on Him, there were some who hated Him. The Bible tells us the religious leaders were jealous of Him. A religious leader was someone who knew a lot about the Old Testament and tried to obey it. They thought that God was impressed with their works. When Jesus spoke to the people, they listened to Him because He spoke with authority. Even though the religious leaders saw the miracles and heard Jesus’ teaching, they did not agree with Jesus. They thought that He was a fake and a liar. The biggest teaching that made them the most angry was the fact that Jesus claimed to be God’s Son. When He said this, the religious leaders wanted so badly to get rid of Jesus but they couldn’t, because the crowds loved Him! Their moment finally came. One of Jesus’ own disciples (Judas) decided to turn Him over to the religious leaders for thirty pieces of silver. While at the feast of the Passover, Jesus had warned His disciples that one of them would betray Him. Jesus and Judas both knew it would be him, so he got up and left to do his evil deed. After the supper, when it was dark, Jesus took with Him three of His closest disciples (Peter, James and John) to a garden (Gethsemane) and warned them to watch and pray while He went and talked to His Father. He came back three different times, only to find them sleeping instead. While He was speaking to His disciples about sleeping instead of praying, Judas led a mob of religious leaders and soldiers to come and arrest Him. After kissing Him on the cheek to show them who to arrest, Jesus was taken into custody. After Judas betrayed the Lord, Jesus was put on trial and was accused of many things. Jesus never said any mean words and never fought back. Not only did these religious leaders accuse Jesus of many untrue things, they also beat Him up. Even though Jesus had all of the power, He didn’t fight back. After Jesus was tried before the religious leaders, they took Him to Pilate. He was the leader over the region of Judea, where all of this was taking place. The Jews told Pilate that Jesus deserved to die, but Pilate found Jesus to be innocent! The religious leaders were insistent that Jesus be put to death and Pilate began to be afraid. He feared that there might be an uprising, so he allowed Jesus to be put on the cross. Pilate said he was innocent of this matter but that was not true. The truth is that no one is innocent of Jesus’ death on the cross. We are all guilty of this crime because of our own sin. When Jesus was hung on the cross, He was placed in between two criminals. One of the criminals began to mock Jesus but the other man realized who Jesus was and corrected him. He looked to Jesus and said, “Lord, remember me when You come into Your Kingdom.” Jesus said, “Assuredly, I say to you, today you will be with me in Paradise.” (Luke 23:39-43) This is amazing! In Titus 3:5 we read, “Not by works of righteousness which we have done but according to His mercy He saved us…” There was no possible way that this criminal could do any good works to get himself to Heaven. He simply acknowledged who Jesus was, believed on Him and pleaded for Jesus to save him! God allowed Him to come to heaven because He accepted what Jesus did for Him! After Jesus came back to life, at least 500 people saw Him. He was on earth for forty more days and then He went to heaven. Before He left, He gave one more commandment. [Read Matt 28:19.] Jesus died for the sins of the whole world, not just a certain group of people. If you have received Jesus’ free gift of everlasting life, you have the responsibility to tell others! If you have not received His free gift, you have the opportunity right now to make that decision. You don’t have to wait to talk to someone about it or to get permission. You can pray to Jesus, there in your seat, and ask Him to save you from your sins. Just as the criminal on the cross understood that he deserved the punishment and realized Jesus was His only hope for eternal life, you can pray and ask Jesus to forgive you of your sins and believe on Him. 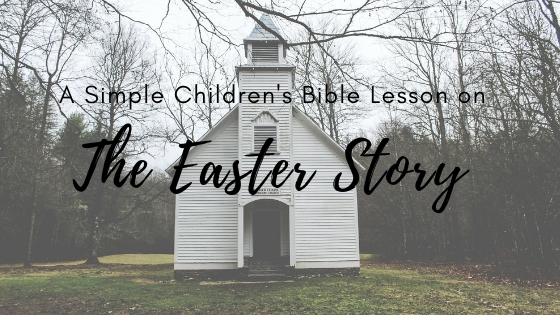 Written by Joanna McFarland, serving Released Time Bible Teacher in Page County, VA.
No Replies to "An Easter Bible Lesson"